I would like to create a custom dashboard with all cross information in context of specific user. I would like to give my support team ability to filter all data from APM, and Browser via specific user_id attribute. In APM I have this attribute now, and I can filter all the data from this module. Do I have to add this attribute also as a custom browser attribute to filter Browser data (page views, js errors, etc. ), or there is other way to connect apm, and browser transactions by attribute? Hi @ibarkowski - Yes, adding the user context to the PageView as a custom attribute will provide you the “JOIN” between PageView and Transaction. You can pop over to this feature request to add the session id to the transaction. @ibarkowski - looks like Stefan was able to help here - he is indeed correct, you’ll need to add the attribute to the Page Views too as well as the APM Transactions. Just one more thing Even if I would add for ex. 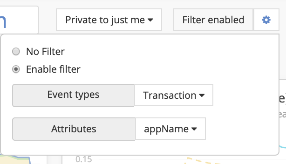 custom attribute named user_id to the transaction (apm), and browser interaction (pageView) as well I can’t build one dashboard with combined information from apm, and browser in context of specific user (user_id) because there is no option to add more filter options to the dashboard. I can choose only one event type and attribute to build the filter (can’t combine event attributes). Is there any other options to achieve that? @ibarkowski In the Event types and Attributes filter dropdown menus, you can pick more than one value at a time.